As I reported earlier, ABC has chosen to cancel the freshman series Commander in Chief. 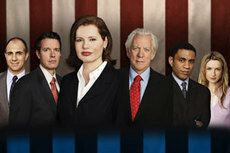 The series stars Geena Davis as President Mackenzie Allen, the first female President of the United States. The show started off strong (with the critcs and in the ratings) but was then plagued by production issues — and then by a declining viewership. ABC has maintained that they believe in show and, though it will not appear on the Fall 2006 schedule, the show may not be gone for good. It’s been reported that ABC chief Steve McPherson is actually in talks with Chief creator Rod Lurie to bring the characters back for a two-hour television movie. The deal isn’t finalized as yet but McPherson sounds hopeful they’ll be able to work something out over the summer. “It’s a fantastic story that Rod has in mind, and there’s still a really dedicated audience for the show,” McPherson said. “It would give Rod a chance to tell a lot of stuff he didn’t get the opportunity to tell and give us another look at it (the concept) in a reconfigured form.” If the movie is produced and is successful, then other Commander in Chief projects may be produced in the future. Commander in Chief: Is Sarah Palin a Real Life MacKenzie Allen? LET THE SHOW resume having an African American Vice President. President Allen is someone people should watch. BRING IT BACK!!!! It’s a GREAT show… Timing is EVERYTHING.. This is the TIME! Commander in Chief was a great show. Sexism is the only reason it did not last. Some people, women too, are afraid of a new system of thought….A woman that can be intelligent, beautiful, feminine, and in command. They just can’t deal with the shock to their thought patterns. Now we have elected a black president…( I voted for Obama too ) but this just shows that sexism goes even deeper than racism. Our family just finishing watching the whole season on DVD from Netflix and was shocked to discover there was not a second season! It was amazing … why did they cancel it? Bring it back, eh? Please bring Commander and Chief back. We can’t believe this program was cancelled. It was fantastic. The only program we went out of our way to make sure we viewed every week. We even purchased the Dvd and still review it often. When ABC cancels programs like this and introduces new programs like cavemen it really makes you wonder who is making the decisions on programing. What a fantastic series. My first thought when it went off the air was that the current administration had something to do with it,just a little bet to close to home. Everyone in the series was fantastic and I really miss it. We own both the DVDs and play them often. Please bring it back. Commander in Chief was one of my all time favorite shows. I looked forward to it all week. When I first heard it was canclled, I could not believe it possible that ABC would cancel such high quality show and replace it with another reality show. I am sad to see quality TV becoming a thing of the past. I really enjoyed Commander and Chief. I hope that there will be a Movie. I will be the first to watch it. I am no longer a viewer for ABC because of what they did to the show. I wont support them. It is obvious they dont know what a good show is because they replaced a good show with a lot of stupid ones. Until Commander and Chief comes back, SO-LONG-ABC! This was probably one of the most enjoyable shows that I have ever watched. I enjoyed watching the West Wing but Geena Davis made this show a top rated show. Can’t understand why you cancel the good ones and keep the stupid reality shows running.. I agree with everyone else that it is a sham that they take such a great program off the air what is your problem. Wow! Were “THEY” afraid that Genna Davis “LOOKED” too much like Hillary? Did viewership drop? Or did “THEY” temporarily shut the show down? I loved this show as did many of my friends and co-workers we’re waiting along with the rest of the so-called dropped viewers for the show’s return. I need commander in chief back! I have been waiting to see the next season. The show in reality only has about 4 seasons in it anyway. Though the timeline doesn’t have to go so fast as it did. I for one loved it when she fired Dicky for not listening to her and then his weaseling ways to go to Templeton’s camp. Saw that one coming. Realilty and Game Shows are much cheaper to make than dramas and therefore intelligent people have little choice when searching for decent programs.